One of my very first books on illusions was U.F. 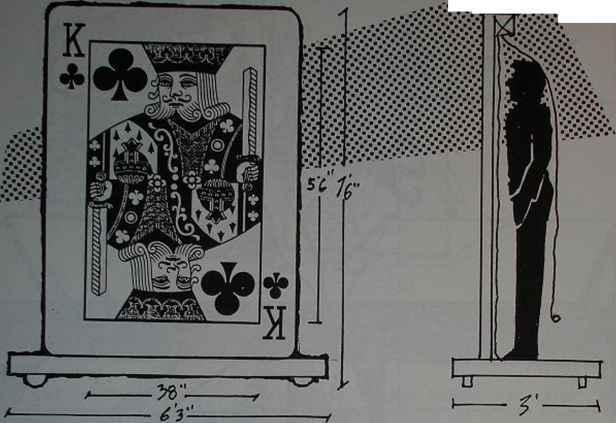 Grant's Victory Carton Illusions. I still have ihe book with my name crudley stenciled on the back. The book was bought at Douglas Magicland in Dallas (409 N. Orvay-I still remember the address!). Perhaps it was sold to me by Mark Wilson who was a demonstrater there at the time, I can't remember. The book features an illustration by Nelson llahne which I have replicated and updated above. Ihe book is only few pages, typewritten with some bad illustrations inside. But what the book held for me was inspiration for a young magician with lots of cardboard and a box cutter. If you don't have the book, I suggest you find a copy. It still has some viable ideas, including this one, the ultimate inexpensive effective illusion, The Victory Girl Production. 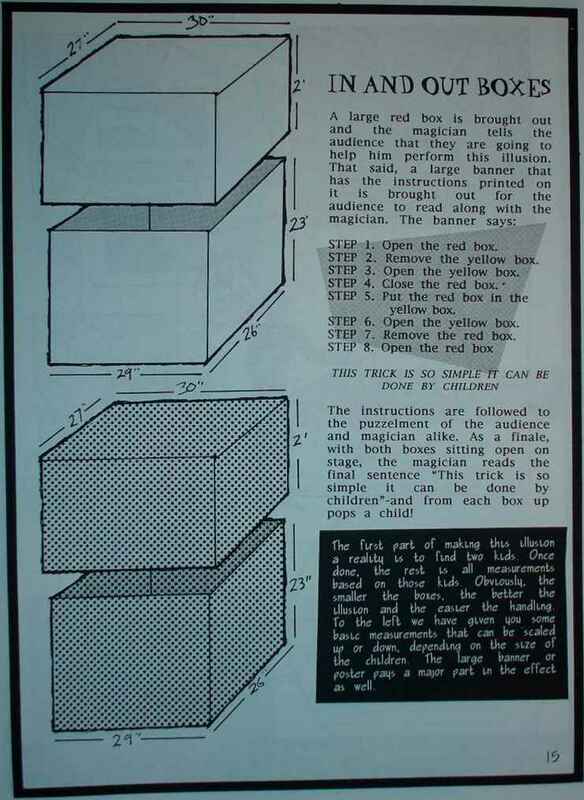 For this illusion uou will require two boxes custom cut with tape hinges as explained in this l?ook. Cut them to these measurements, and notice that the box without the hole in the back is the larger box. 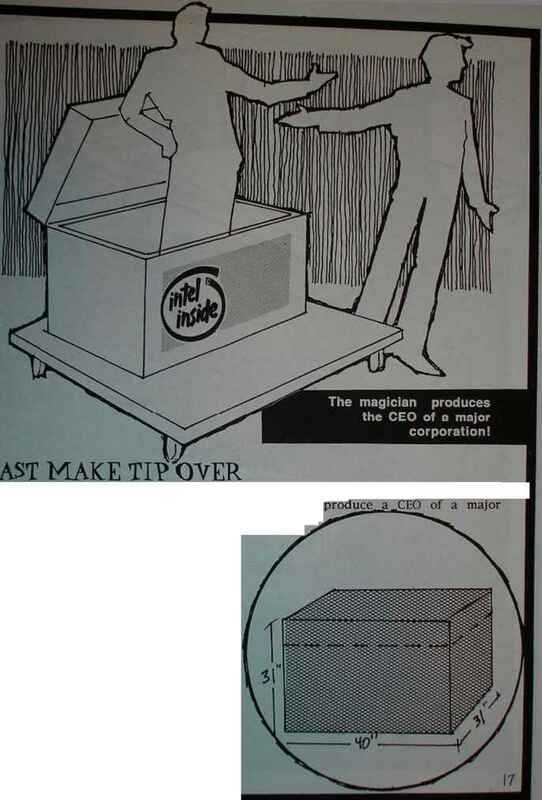 In performance your assistant is hidden behind the larger box and the box with the hole in the back is in front toward the audience as in our bottom drawing. The next step is to show the box with the hole in it. This is done by lifting the box and slowly tilling it toward the audience as if to fan them. The box is not opened at this point and the hole is toward the back. The box is put on the stage and opened up so that it's backside is touching the edge of the larger box. 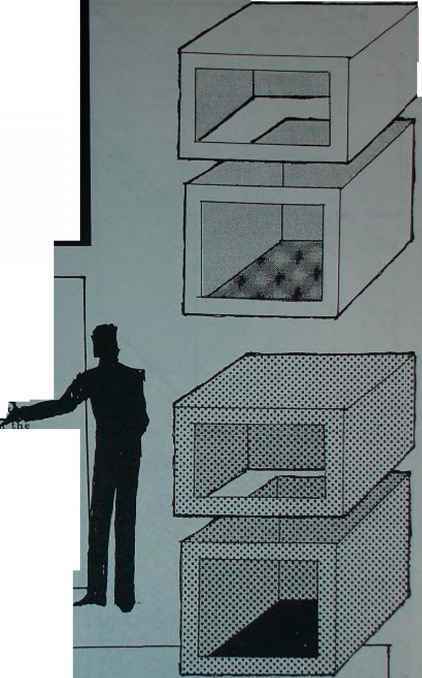 It is at that point that the assistant crawls from behind the big box through the hole and into the smaller box as in our illustration below. Once the girl is in the box the larger box is lifted and displayed in a similar manner. It is then opened up and nested over the smaller box. Once it is down on the ground both boxes are rotated to show all sides, being careful to not raise them and show the hidden assistant.At this point you make a magical gesture, your assistant stands and she is lifted out of the two boxes to take her bows. As mentioned this illusion is the genius of U.F. Gen. Grant, it's very effective, easy to build and requires a minimum amount of rehearsal. The first part of making this illusion a reality is to find two kids 0nce done, the rest is all measurements based on those kids (?bviousli|. the smaller the boxes, the better the illusion and the easier the handling fo the left we have given ijou some basic measurements that can be scaled up or down, depending on the size ot the children The large banner or poster paqs a major part in the eltect as well. The instructions are followed to the puzzelment of the audience and magician alike. As a finale, with both boxes sitting open on stage, the magician reads the final sentence "This trick is so simple it can be done by children"-and from each box up pops a child! [he banner cou\d be made fom wood or foamcore. or it could be a cloth banner that sets up on a tripod. A signpainer or sign company can do the lettering. STEP 1. Open ike red box. STEP 2. Remove tke yellow box. STEP 3. Open the yellow box. STEP 4. cloflc tke re cl b oi STEP 5. Put tke red box ¡i yellow box. PI AN VIEW 5H0WIN6 M CHI LPEEN C0MIN6 mom M PACK CURTAIN ANt? INTtf m PACK 0? THZ VOW? The magician produces the CEO of a major corporation! The quckest wan to the trunk itself is to fabricate a box witli no bottom The box should be made from 1/2 screwed and glued together the five sides should be made to be 57" tall. W* wide and 28» deep. Once trie box is made, use a hand saw to cut down Uom tlie top all the wan around This will make the chest and the lid will fit perfectly!